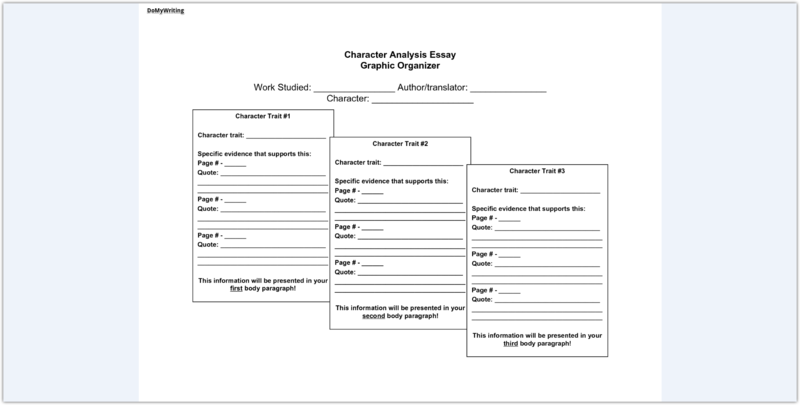 Character Analysis is a complex evaluation of a book or novel character. This type of work requires very critical view on a key character, thinking about which role it plays in the whole story, which prototypes it may have in real life and how it can influence a reader. Writing character analysis it’s very important to stay objective. It’s not recommended to make your personal preferences affect evaluation of certain features or actions of a character. Aim of any analysis is not to judge a character but mostly to reveal deeper features of it, making a reader understand it better. Analyzing a character, you shall mention age, gender, appearance of a book hero. In a case if an author doesn’t mention exact age or origin, you can make your own conclusion based on the information written in the book. Try to guess approximate age, profession or society class a character belongs to, according to story plot, historical and cultural background of the time described in a story. It’s important to concentrate on inner qualities of a character: type of personality, psychological state of a person, believes and motives. Reading a book attentively, you may notice a lot of quotes that may speak about personality of a character. You can use these quotes to make valuable conclusions or to apply as illustrative examples while writing your analysis. 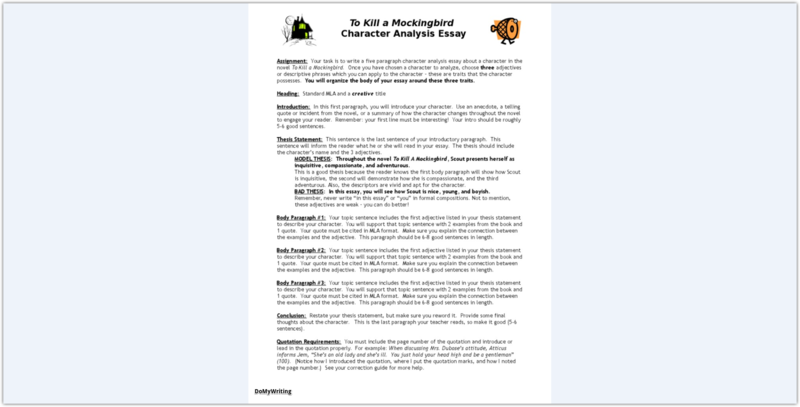 Character analysis is a kind of academic work that trains your critical thinking, attention and logic. It also helps to become better psychologist and to change your attitude to people around. This task is given both to school and university students. It has specific structure and algorithm of writing that may slightly differ depending on age and specialty of students. 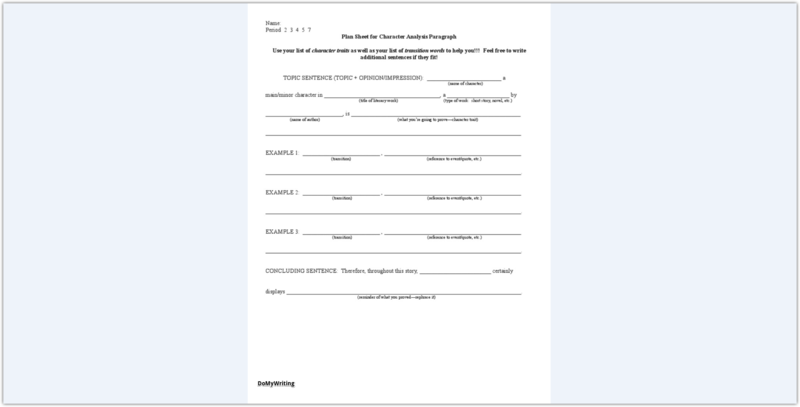 Many students are only rewriting author’s words about a character, wondering while their work is not evaluated highly. 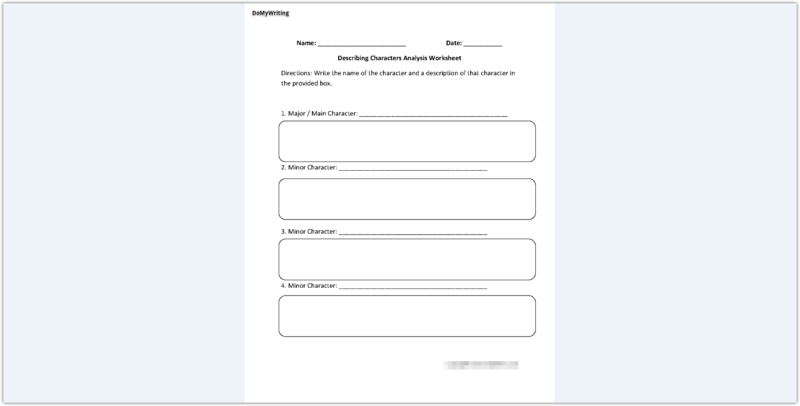 The reason is that character analysis is not only collecting data about a character, but mainly a reflecting of how you understand a character. To make your analysis informative, go beyond understandable descriptions that are visible to anyone who reads a book. Try to read between lines, thinking what a certain event, phrase or reaction of a character may mean. A book author may avoid giving a hero clear characteristic like brave, clever, greedy, kind or egoistic. However, in most cases this can be said from the context. Avoid making conclusions too early, as many novels show how people change in process of living or how certain circumstances may influence their behavior or even personality. Try to make your conclusion based on the widest picture given by an author. Be ready to apply to some additional resources if you feel you need to understand time or culture a character lives in. Find out what inspired an author for writing a book, to whom it may be dedicated. Sometimes it’s even possible to discover a real-life prototype standing behind literature character. If you a looking for an alternative opinion about a character ask your friends or internet users what they think about a person described in a book. It may be useful to hear ideas of people of different generations and genders. If a book character is connected to a foreign culture that is not really known or understandable for you, try to address people of the same nationality or those who have better understanding of that culture. Thoughtful reading and a small research may help you to come to creative ideas that will add great value to your future writing. Analyzing a book character is a very interesting and even funny task. Working with it, you shall remember that you analyze two things at once: a book character that may never exist in real life and a creative process of an author. It may be interesting to discover that an author adds his own features and those feelings that are acceptable and understandable for him to key characters. That’s why studying some biography of an author may be as important as careful analysis of the story itself. Think about reasons that may force characters to act how they do. Think how ethic or correct their behavior is, what may stand behind their actions. Go beyond time described in a book, think about possible undescribed events that could happen to characters when they were kids. Remember those actions that a character did during the whole story. Pay attention at small things that don’t play great role for the general plot but may say something important about a character’s personality or psychological state. Think how actions of characters may affect others or influence general mood. Think about phrases used by characters. It’s important to analyze what they say but it also important to guess how they say it. Try to understand if a character speaks like an educated person or use simple words more common for people who couldn’t get higher education in described times. Think if a character uses too much slang or speaks in an unusual manner. All these details may reveal a lot about a described character. There are two types of descriptions that are given in a novel. The first is how an author describe a character and the second is how other book characters speak about it. Pay great attention at descriptions. Remember, it’s important to read between lines, trying to see more than what is obvious. It’s important to analyze names of characters. Nicknames may say a lot about past of a character, they may also reveal reputation and attitude of character’s friends. Name may reflect social position of a person especially in those stories that are written about past times. Name often indicates origin, nationality, possible religion of a character. Antagonist – an opponent of a main hero. Often this character is described as a negative one. 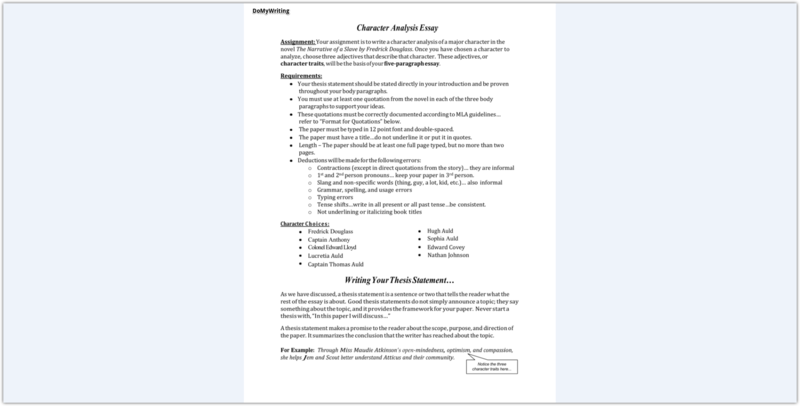 Major Character – a character that plays important role in the story. It’s not necessarily protagonist, it can also be an antagonist or other type of characters. Minor Character – a character that plays small role in the story. Usually these characters appear for a short time. Dynamic Character – a character that may be showed from different angles or is changing during a story. Usually this is a major character. Static Character – a character that stays unchanged during the whole story and keeps its moral position under any condition. Stereotypes – these characters are often used for creating necessary atmosphere of filling the space up. They won’t play any important role but may add some special meaning to situations described in a book. One character may be classified as several types at once. For example, protagonist can be classified as a dynamic character a major character or static character. Some characters change their type during a story. Changes may wonder or surprise you. However, the more complex a character is the more interesting his analysis can be. If you feel difficulties with determining type of a character, concentrate on other characteristics, like personality, role and meaning of a hero. Think about most stable and understandable features of a hero. Complete the portrait with some facts and finally add specific qualities of a character that are seen only after careful reading between lines. Find out which role a character plays for the whole story or perhaps for the whole situation or historical epoch described in a book. Analyze which changes a character had influenced by different events and occasions. Think if there is any progress of growth or if a character becomes more unhappy and limited person. 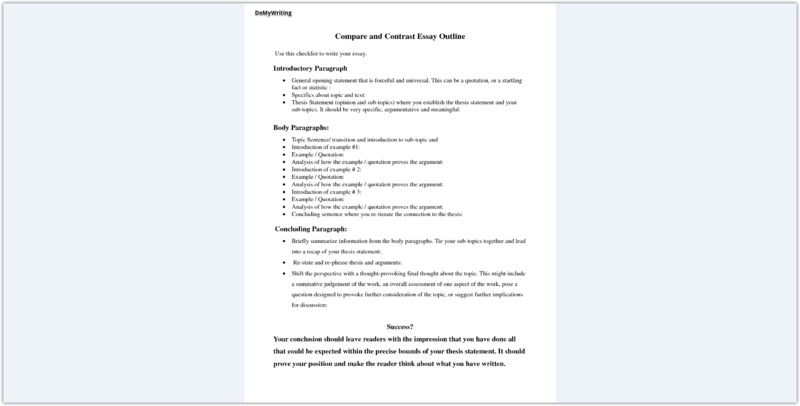 Introduction helps to attract a reader and gives some understanding what the whole analysis is about. Use your creativity to make beginning of the writing attractive, but don’t forget to include simple and clear explanation what you write about. Mention names of a book and a hero. Body is the main and the biggest part of any writing work. Here you can use all the information that can reveal character qualities better. To make this part more understandable, use lists, paragraphs and other markers. 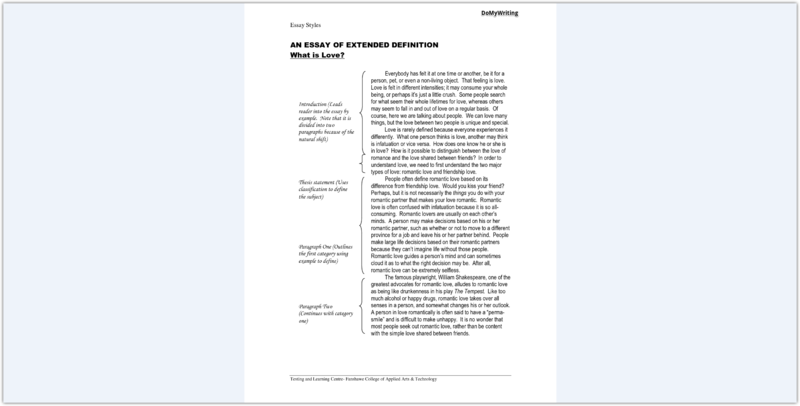 In this part of an essay you can sum up all what you wrote before. 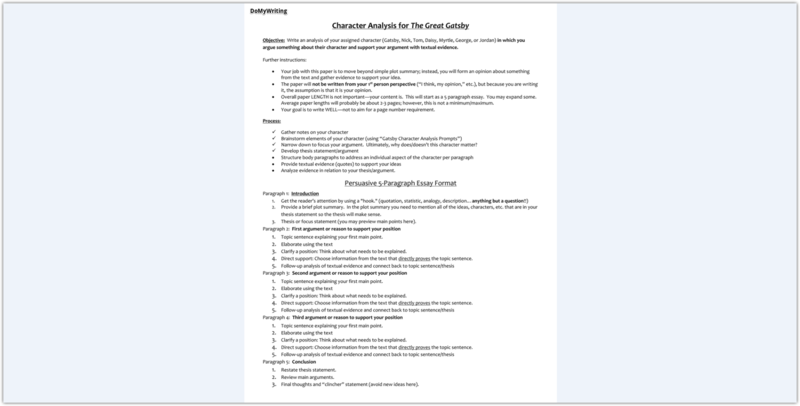 Make laconic analysis of a character role, features and development. In this part you can also explain your personal attitude to a character or explain why describing the hero was important for you. In the case you are not motivated to write any essay or have no time for that, you can address professional team of writers ready to offer you high-quality assist. Our professional writers can write any type of writing work meeting your requirements. You can also ask for help in editing or checking your work. Check the complete list of services on the site.